‹ Just arrived in my office.. The shahada is not formulated in the quran. In the quran the only people who give testimony that mohammed is the prophet of allah are described as hypocrites. Islam is based on the Quran AND the sunnah as you well know. Sunnah is not the word of god. It is generations of hearsay, relayed over centuries by fallible and biased men, recording the fallible memories of people whose testimony often takes the form of something they overheard someone saying the prophet said to someone else. Actually the Quran speaks many times of the sunnah of Allah. You did not know that. Quran also says to follow the teaching of His prophet, thereby establishing the sunnah of Muhammad for Muslims. See the quotes from the Quran below. Paul why do you follow a religion based on the words of men? You do – Jesus was man. for all we know, surahs 3 and 48 were revealed years apart – it is only by making huge theological leaps that you can put them together and say that they are intended to somehow supplement each other. The shahada is man-made nonsense. Graham this blog is for serious discussion. All you do is abuse this privilege. Get respectful and serious or p*ss off. The BIBLE is not the word of God, it is collections of writings, heresay, and forgeries, relayed over centuries by unknown fallible men and pseudepigraphal authors whose testimony is not corroborated by a single witness, and are not validated or approved by Prophet Jesus himself. Sorry but you walked into that one. As you said, surahs 3 and 48 were REVEALED years apart. Since they are revealed from the same divine source, and are contained in the same Qur’an, revealed to the same Prophet, we can conclude that of course the supplement each other. There is no theological leap in saying and believing that. A bigger “theological Leap,” for example, is saying that Isaiah prophecies Jesus and the crucifixion. In fact everything about the newly innovated Christian trinitarian doctrine is a huge theological leap from the OT, I could go on, and on, and on……….. If you want to talk about “Man-Made Nonsense” we can start by talking about the New Testament. Sleight of hand isn’t going to impress anyone but your fanbois. Where is the sunnah of allah, and which sunnah of mohammed are you commanded to follow? And why should I not follow the hadith of the shia? Their’s has as much historical credibility as yours. That is the funniest thing I’e heard all day. That’s an honest admission that nowhere are muslims commanded to declare mohammed as a prophet in order to consider themselves muslims. How does your tu quoque refute the fact that the hadith is completely man-made hearsay, written centuries after mohammed died, by men who never spoke to or knew any of the people it writes about personally? The OT is full of references to the plurality of god – you should read it sometime. God might say to obey Muhammad in the Quran, but God didn’t reveal the sunnah in the Quran. Thus, most of your religion is actually based on the words of men, not God. And we know that Muslims fabricated hundreds of thousands of Hadith. A circular notion of isnad confirmation from the Hadith in question doesn’t solve the issue, it’s simply illogical circular bias. Btw, why does Muhammad associate himself with Allah in the shahada? Shirk? 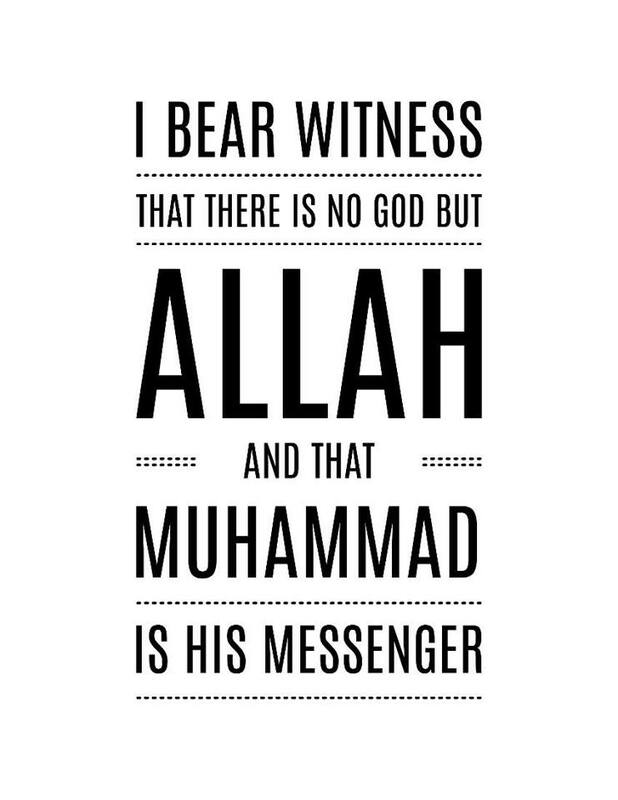 It is clear that Prophet Muhammad (sws) did not associate himself with any divinity, Hence, “there is no God but God” the second part of shahadatayn simply states that Muhammad is the Messenger of that One God. Though I am sure you already knew that and are simply trying to throw dust in the eyes of truth-seekers. Any fabrication of Hadeeth affects a secondary source for Islam. While your first source the NT has been proven by modern Biblical scholarship to be largely a fabrication. Ouch sorry, but you forced my hand on that one. You and your Christian friends are the ones who associates partners with God, by insinuating that Prophet Jesus is a part of a Triune Godhead, while it is clear that Jesus never made such a divine claim about himself. If there was ever a man-made religion it is yours. But as you said, “all means practice your religion” you are welcome to it, Let Allah be the judge between us. Okay, where does allah name the books that you are supposed to get this info from? In fact, where in the quran is the example of the “messenger” revealed? If the Hadith is a secondary source, then you have just dismissed the shahada since the shahada comes from the Hadith, not the Quran. Thus, you just falsified your own argument and religion. Plus this post becomes unimportant. I believe Muhammad associated himself with allah because the creedal statement of your religion is not exclusively divine. If one cannot be a Muslim (submitted to Allah) without affirmation of Muhammad, then effectively Muhammad has associated himself with Allah. That is why Islam is not in actuality monotheistic. In practical and credal terms it is polytheistic. Can you be a submitter to Allah and not follow the sunnah? Islam is based on the Quran AND Hadith – not Quran alone. So there is no problem. do you know that if we follow your logic then you, jesus and the christians are dependant on the understandings of the sanhedrin? you can call it “creedal statement” or whatever , but you clearly are DEPENDANT on the decisions of sanhedrin because your god told you so. also , you would have to AFFIRM prophet hood of moses because god said so. if you don’t then you have disobeyed your god. jews today simply listening to their god and their GUIDES because the bible told them so . Well there is Paul is the Hadith is a secondary source. I repeat: can one be a muslim and not follow Muhammad? of course. The Qur’an says as much. The Shahadatayn is the key to Paradise, and salvation does not come through any blood sacrifice. I say to any non-Muslim truth-seekers who come to believe that God is absolute in his oneness, and who believes in that which is seen and unseen, the angels, heaven and hell, whoever believes in all of the Prophets and their revealed divine messages, including the status of final and last Prophet, Muhammad (sws) and message revealed to him in the Most Holy Qur’an. I invite those who are sure and firm on this belief to recite the following words, and enter through the door of Islam and become Muslim committed to walking the straight path, and partaking in Allah’s promise to grant Jannah to the true believers in his Shahada. “Ashadu an La illaha illa Allah, wa Ashadu anna Muhammada ar-Rasul-Allah” – Amen! We welcome all new Muslims to the faith!!! Where in the quran does allah refer muslism to this “sahih muslim” collection? Where does Prophet Jesus refer to the NT writings of Paul? they didn’t exist. only the ot did. Less tu quoque, more honesty please. Jesus’ message, example, and words are all contained within the gospels. The Apostle Paul afirms this teaching and history. Now your turn. WHere in the quran is the teachings and specifics do mohammed’s life affirmed in the quran? Tu Quoque indeed. You speak of honesty, while questioning a secondary source in Islam, and at the same time expecting us to overlook the fact that Jesus never affirmed the NT or any of Paul’s writings. As Rider and I both noted below your criticisms only touch minor non essentials in Islam. Whereas, the major fundamental and essential doctrines of Christianity have been revealed to be false and innovated. shouldn’t that concern you ? Most o muslim practice is not found on the quran – name it and almost certainly it is not in the quran. 5 prayers? Not in the quran. Going to mecca to make the hajj? Not int the quran. Circling the kaaba 7 times? Not in the quran. Shahada? Not in the quran. SHaria law? Not in the quran. The hadith is islam, and the quran is secondary. As for jesus’ teachings, where in the quran does allah detail jesus’ teachings and life? Somehow, your god seems strangely ignorant of the life of one of his messengers. The quran doesn’t tell muslims to follow the hadith – doesn’t that bother you? Islam is primarily based upon the Qur’an. The most important things are explained in the Qur’an. The Sunnah is not transmitted though particular narrations but though tradition. Everything regarding Islam that is important is known without doubt. The other disputed things are not of essential importance. With disputed things I mean those disputed among Sunnis. You have a problem with Tawhid. All these arguments you bring cannot destroy Tawhid. Even if you could prove something false in the Qur’an it would not prove Tawhid wrong. Well said. The critics of Islam can only touch minor non essentials in Islam. Whereas, the major fundamental and essential doctrines of Christianity have been revealed to be false and innovated. Tawhid will never be refuted, since it is also affirmed and rooted in the OT as well as Qur’an and those who believe in the Oneness of God, must look elsewhere outside Christianity to find a religion accepting of non-Trinitarian belief. The true followers of Prophet Jesus and his One True God, are invited to find a welcome place in the deen of Islam! sharia is not revealed in detail in the quran, so islamic law is largely 7th century arab superstitious nonsense, derived, I would guess from pre-islamic pagan legal practice. Explain tawhid, why don’t you? Who is allah? And how can you be so sure? Catholic Canon law is not revealed in the Bible, so I guess you think that is superstitious nonsense, on second thought don’t answer, I know you are probably Protestant. It is funny to hear Christians speak of Pagan practices, when ritual blood sacrifice and Trinitarian Gods are straight out of the Pagan tradition. My opinion of catholic practice is irrelevant – the truth or falsity of catholic belief does not change the fact that the quran does not affirm the teaching o the hadith. There is nothing I have to discuss with you, Graham. I would have loved to discuss the tawhid with you. First of all, surah 4 was revealed, perhaps years into mohammed’s supposed prophetic career – which is strange since if it was so important to obey mohammed, it should have been made clear from the very beginning. Secondly, what examples of mohammed’s life does the quran reveal? ANd if there are only a few examples given, where does it refer muslims to books written generations after mohammed lived, by men who had no personal acquaintance with the people whose hearsay it records? I think you have become a troll officially. Quran is very clear that we should follow the prophet pbuh. Days ago, you’re arguing that we should follow the prophet pbuh in everything according to Quran, and you think that’s a bad thing! What happened? Have you forgotten? Or just a trolling tactic to avoid the fact that Jesus had never taught that he is God himself in the gospels. He’s a troll. But he’s on a tight leash. @Graham: Now your turn. Which part of teaching of Jesus do you follow? 1. Do you worship the God he worshiped? Well it seems you worship God the Son and the Holy Ghost in addition to God the Father (who alone was worshiped by Jesus). 2. You believe salvation by believing in death and resurrection of Jesus? Can you point out where Jesus every once said to any of his disciple of believe in this formula? Please assume that crucifixion really happened. But did Jesus ever say you to believe in it as means of salvation? 3. You believe in original sin. can you point out where Jesus taught this? 4. Jesus asked u to OBEY those who sit in Moses’ seat (matthew 23:1-3)? So whom do you OBEY? those who sit in Mose’s seat and reject trinity or those who who don’t sit in Moses seat and preach trinity? This verse alone should enough for you to reject trinitarian xnity if you are logical. what did the seat say to the other seat? Yikes! Grand (or Graham) Slam!! Great remarks by RM. Before I answer your easy to answer questions, would you kindly show me where in the quran jesus’ teachings and life are detailed? When does the quran say jesus lived? What country did he live in? WHere did he travel to? What were the names of his disciples? WHich cities did he perform his miracles in? What was the name of the religious figures who tried to crucify him? Who was the governor of Israel at the time? WHere is the ministry of the Apostle Paul refuted? Where does the quran mention the Apostle Paul? Thanks. An answer would be of great help in helping me to understand islam. @graham: how are answers to any of these relevant to the questions I asked? Moral of story: don’t go in details that is not relevant. the relevant thing is to know whom you worship and why you worship him. and to know how to attain salvation and principles on which to lead your life etc. my questions are relevant in that I have absolutely no reason to trust the quranic writings about jesus because it provides no details of life and ministry. Ten thousand years from now, if someone finds a quran and reads it, he would never know that the guy written about in it is the same guy written about in the gospels – even the name is wrong and the ancestry of his mother. Whoever denies the first point can only be a pagan and whoever denies the second point can only be a secularist. God is depicted as plural in the old testament – numerous times. Irrelevant. Completely. Irrelevant. And a blind assertion. Where in the quran does it say this, and, more importantly, where are sharia laws themselves detailed in the quran? 3 And said, Adonoi [Hashem, see v.13], if now I have found chen (favor) in Thy sight, pass not on by, please, from Thy servant; Let a little water, please, be brought, and wash Thy feet, and rest under haetz (the tree); And I will bring a morsel of bread, and refresh Ye Your hearts; after that Ye shall pass on; because for this purpose are Ye come to Your servant. And they said, So do, as thou hast said. And Avraham hastened into the ohel unto Sarah, and said, Make ready quickly shlosh measures of fine meal, knead it, and make cakes. And Avraham ran unto the herd, and brought a calf tender and tov, and gave it unto a servant; and he hasted to prepare it. And he took curds, and cholov (milk), and the calf which he had prepared, and set it before them; and he stood by them under haetz, and they did eat. And they said unto him, Where is Sarah thy wife? And he said, Hinei, in the ohel. And Avraham ran unto the herd, and brought a calf tender and tov, and gave it unto a servant; and he hasted to prepare it. 8 And he took curds, and cholov (milk), and the calf which he had prepared, and set it before them; and he stood by them under haetz, and they did eat. And they said unto him, Where is Sarah thy wife? And he said, Hinei, in the ohel. And He said, I will certainly return unto thee at this time next year; and, hinei, Sarah thy wife shall have ben (son). And Sarah heard it in the entrance of the ohel, which was behind him. And He said, I will certainly return unto thee at this time next year; and, hinei, Sarah thy wife shall have ben (son). And Sarah heard it in the entrance of the ohel, which was behind him. A nice block of cut and paste text. Not sure anyone will read it. Stormrider seems to have no thoughts of her own. I just want to know how many storms has she actually ridden? Is the answer to my question……191?